The star of Mad Men might be a serious candidate to play the new Man of Steel. Warner Bros. might have found the right star for Alfonso Cuarón's Gravity. 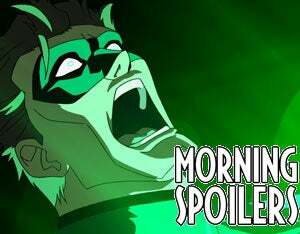 Plus lots of spoilers for Fringe, Chuck, Clone Wars, and more! John: One thing we learned from Quarantine is how difficult subjectivity is. If you're in one place, moving through a space, that's a powerful first-person thing. When you're in this elevator in Devil, we tried to show one character and then what they were seeing and it places the audience in the elevator and it saved us from doing 500 shots in just this single elevator. Drew: When we're outside of the elevator we tried to shoot in a more objective style. The audience won't notice the difference in styles, probably, but you'll feel it. "Aquaman is such a bubble-gummy type of character [who] doesn't get a lot of respect as a superhero, so to be able to come and play a darker side is going to be a lot of fun. He's a limited character-as far as needing a lot of water around-but there are ways to justify it. Plus, I like to think of him as quite a cool superhero, and having the chance to go back for the final season [of Smallville] is huge." "I'm still the way I've always been - lots of hair and eyes. A bit Raquel Welch-ish. I'm the queen in exile, locked away in a dungeon for 15 years. It's mother abuse!" The Powells are about to go from ordinary to extraordinary. After 16 years of marriage, Jim (Michael Chiklis, "The Shield," "Fantastic Four") feels disconnected from his workaholic wife, Stephanie (Julie Benz, "Dexter"), and two teenage children, Daphne (Kay Panabaker, "Summerland") and JJ (Jimmy Bennett, "Star Trek"). To encourage family bonding time, Jim decides the family will join Stephanie on her business trip to South America. When their plane crashes into the Amazon River, they barely enjoy a moment to celebrate their survival before returning to the grind of everyday life. But they will soon realize that their lives have been forever changed. Each member of the family starts to show signs of new, unique and distinct super powers. Will their newfound abilities finally bring them together or push them further apart? On the premiere episode, "Pilot," the Powell family must learn to deal with the super powers each has mysteriously acquired after the crash of their plane in the Amazon River. Jim discovers that he has the power of super strength and immediately feels a new sense of purpose and empowerment. With the aid of his best friend and confidant, George, he sets his sights on becoming a hero. Stephanie struggles to balance her family life with working 80 hours a week as an award-winning scientist, and after developing the power of speed, she can now move effortlessly through her daily responsibilities. Always the scientist, Stephanie immediately questions the phenomenon and, with the aid of her lab tech, Katie, the two begin to research the mystery behind the powers. For 16-year-old Daphne, she turns telepathic and hears other people's hopes, dreams, fears and joys, whether she cares to or not. And 14-year-old JJ struggles constantly to satisfy his parents and teachers as he grapples with a learning disability and bad grades. But he suddenly finds his mental abilities strengthened to a super genius level.